Summer is time to eat healthy food because admit it or not, we wanna look good in our summer attires while strolling along the beach or just backpacking with your friends. And with this year's hottest healthy food event to hit the metro, it time to get ready and join the fun of My SuperFruit Day! 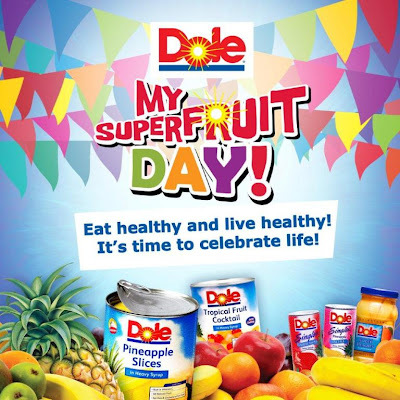 Spearheaded by Dole, a leading name to delivering fresh fruits and vegetables, this fun and healthy whole-day affair will be happening at SM Mall of Asia this coming May 7, 2011! Get a glimpse of the wonderful mix of colors through the magnificent displays of fresh fruits and vegetables along side the exciting activities and events that await to those who will grace this event. Aside from the fun and excitement, expect to catch Philippines' golden treasure through an amazing exhibitions of talents from the contingents of Higantes, Maskara, Panagbenga, Sinulog and Pahiyas Festivals. Cash prizes will be awarded to the contingent who has the most number of members. So if you are from the provinces in where these festivals happen or if you are a local of that place and wanna witness this first-ever fruitful event, head to the said venue and be proud of your roots. An individual costume contest will also take place on this event giving away Php15,000 to an adult who will be hailed as the Best in Fruit Costume and another Php15,000 for the Cutest Kid in Fruit Costume! Fun, right? There will also be a prize for the coolest guy in costume who will be photographed nicely, so remember to smile always or be wacky in every pose that you'll make, okay? This upcoming event will be hosted by the talented Tuesday Vargas and the hunky Jon Avila. Sitti will also be there to serenade us, so catch that too! Celebrate life, celebrate the goodness of Earth and join the fun of My SuperFruit Day in SM Mall of Asia this May 7, 2011! Happy summer and see you all there!